Provide comfort for the family of Donald Brown with a meaningful gesture of sympathy. A devoted husband, father, grandfather, great-grandfather, brother, and uncle, Donald A. Brown, age 89, resident of Orange, passed away peacefully,surrounded by his loving family, at his home on Thursday, November 29, 2018. Born on August 28, 1929 in Bridgeport to the late James and Sylvia Watrous Brown. 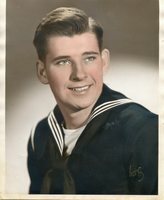 Don proudly served in the U.S. Navy on the U.S.S. DeMoines. After his service he worked 35 years for Connecticut Light and Power as a shift supervisor until retirement. He enjoyed sports, playing cards, and working in his yard. He devoted much of his time to his family and will be remembered as such. Don is survived by his loving wife Mary Schumann Brown, daughters Catherine McKenzie (Joseph) of Orange, Suzanne Hewig (Fred) of Trumbull, Donna Vreeland (Robert) of Northford, Brenda Hotchkiss (Cliff) of Orange and Carolyne Maniscalco (Ted) of East Haven, grandchildren Melissa Roberts,Donald Sciascia (Stacey), James Sciascia (Maryann), Matthew McKenzie, Michael Sciascia, Jennifer Vreeland (Rob Birchard), Mary McKenzie Sa (Mike), Stephanie Hotchkiss, Brittany Sciascia and Nicholas Maniscalco, eight great-grandchildren, his sister Joyce Lonkoski, and several nieces and nephews. Don was predeceased by his parents, daughter Sharon Sciascia, twin brother Dudley Brown, brother James Brown, and sisters Rhoda Ulatowski, Jean Michlewski and Betsy Brown. Calling hours are Monday, December 3, 2018 from 4pm to 8pm at the Smith Funeral Home, 135 N. Broad St., Milford. A funeral service will be held in the funeral home on Tuesday, December 4th at 10am. Interment will follow in Orange Center Cemetery. In lieu of flowers, donations may be made in his name to the VA Medical Center, Voluntary Service (135) 950 Campbell Avenue West Haven, CT 06516. To send flowers in memory of Donald A Brown, please visit our Heartfelt Sympathies Store.